Early Bird vs Night Owl: Are There Any Benefits To Waking Up Early? Home » Early Bird vs Night Owl: Are There Any Benefits To Waking Up Early? If you’ve been around on social media long enough, you’ve definitely seen those go-getters who swear by their morning routine: wake up at 5am, do yoga, drink some strange concoction they swear has magical powers (like kombucha or butter-coffee), perform 1000 crunches, whatever. However, with so much hype around early mornings and getting after it from the wee hours of the morning, it’s easy to see why we need to discuss the issue! Aside from having your life together, are there any benefits to getting up early? Is your sleep schedule helping or hindering your progress? Today we’re going to talk about how early mornings and late nights affect you and why you should be getting up earlier. The first point we need to raise, is that a late night or early morning are a bad idea if you’re not sleeping the right amount. If you’re getting less than 8 hours of sleep, you need to focus on fixing your schedule first – this is crucial to mental performance and exercise performance. After all, you only need to be 5% more productive per hour to justify that extra hour in bed. Sleep is the time when your body focuses on recovery and balancing hormonal health, with sleep deprivation interrupting both of these processes and dropping your productivity big time. When you’re getting enough sleep, the next question is when to sleep – what are the benefits to being up early? To start with, you’re going to want to maximise your exposure to light during the day. This is important for a few reasons – to start with, it’s a key regulator of your mental health and lets you keep your body clock on-time. There’s a special receptor in your eye called the retinal ganglion that tells your brain that its day time when its hit with blue light. This exposure improves your alertness and reaction times, waking you up for the day – something you’ll need if you’ve got a busy day, and definitely a good reason to wake up before noon! Secondly, the amount of light you’re exposed to during the day is associated with regulating your mood. Especially during winter, getting an extra hour or two of sunlight in during the morning is going to positively affect your mood and combat seasonal affective disorder. This is a common condition of sadness and poor-mood that comes on during winter. Maintaining good sleep hygiene – sleeping enough, getting enough light, and waking up around the same time on a daily basis are great for a sense of orderliness and control in life. They also combat anxiety, let you plan your day, and are commonly cited as key to the routines of successful people. It’s not just mood, however: your body actually changes in response to the amount of light that you experience during the day. For example, while you might have heard about how blue light is bad for you at night, you might not have known that the total amount of light – and blue light specifically – you take in during the daytime improves the quality of sleep. A day full of blue light (e.g. from the sky) regulates melatonin – the hormone responsible for regulating sleep and, thus, recovery. There are even early suggestions in the science that melatonin is anti-catabolic in certain circumstances, and may be involved in the regulation of protein synthesis. What we know for sure is that better daylight exposure means better sleep which means muscle-gains! You also want to maximise your exposure to sunlight during winter to help with vitamin D deficiency. This is the most common vitamin deficiency and even more so during winter when you’re unlikely to get those 8-12 hours of sunlight your body wants. You should be supplementing vitamin D, but you should also be maximising your exposure to natural sunlight. This is another way your body regulates testosterone, mood and mental health – getting a combination of natural sunlight and supplementation can get you to the 2,500iu per day you need for the best cognitive and exercise results. Clearly, there’s a benefit to getting up early-ish. You don’t want to be waking up too early for no reason, but you should be up just before the sunrise for the best quality sleep, recovery, and mood. This comes with the territory of talking about early and late wake-ups: when are you going to be at your best to train? The answer, however, depends on the kind of training you do. We’re big fans of training cardio in a morning as the endorphins released are a great way to energise and you don’t have an excuse to not do it if you go straight away. However, if you’re looking for a perfect strength workout, you’ll want to start training around 4-6pm. This allows you enough waking hours to potentiate your muscles and ensure you’re moving those joints around before you start loading them heavily. You don’t always get control over every detail of your schedule, but if you can shift strength and power training to later in the day – and cardio early on – you’ll squeeze the most out of your day! While the science says you should be spending as much time in sunlight as possible, it’s probably also worth thinking about how your behaviour works during the day, after dark, and then how you think about sleep. Remember, you get the same amount of waking hours if you sleep earlier and get up earlier. This is really obvious, but how often have you pulled a late-nighter for work/studying that could’ve been done the next morning? We like to think the things we want to do – and need to do – are better done right now but honestly ask yourself if you can just watch that last episode or finish that PowerPoint in the morning. You’ll have the same amount of time, but you’ll be energised and not have a day’s worth of fatigue on your brain! 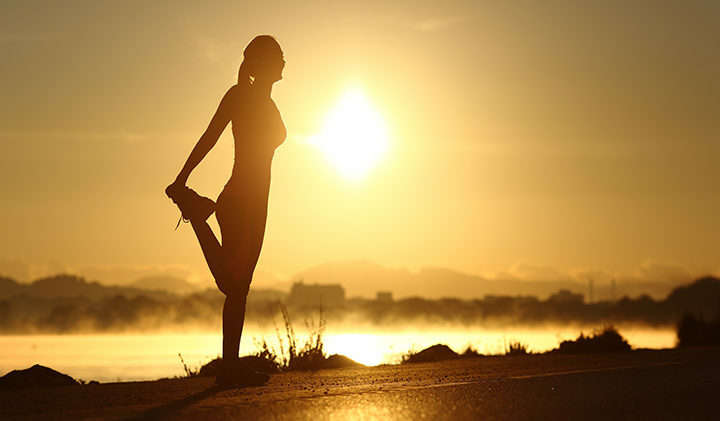 Early birds do get the worm: increasing the amount of time you’re exposed to sunlight is great, you’ll feel more energised and able to deal with the tasks of the day, you’ll be more awake when you turn up to your first task of the day, and you’ll have better sleep quality when you do rest. Make sure to maximise your time in the sun, minimise your time awake after sundown, and try to shift as much of your screen-time to the start of the day. These small changes can make a huge difference to awareness, routine, and recovery quality!